Happy Easter, tributes! To celebrate we’re going to show you how to get to the Part 2 Easter Eggs! So there are in fact 3 short deleted or rather extended scenes from The Hunger Games: Mockingjay Part 2. How to access these three scenes requires the skills of Beetee and Part 2 on Blu-ray. 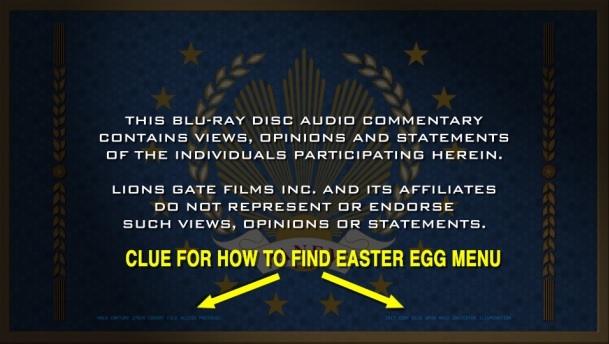 Trust me, if Lionsgate hadn’t contacted us there is no way we ever would have discovered the existence of this Easter Egg menu! Luckily we’ve been guided to them and are here to show you how to get your hacking hands on those three scenes. 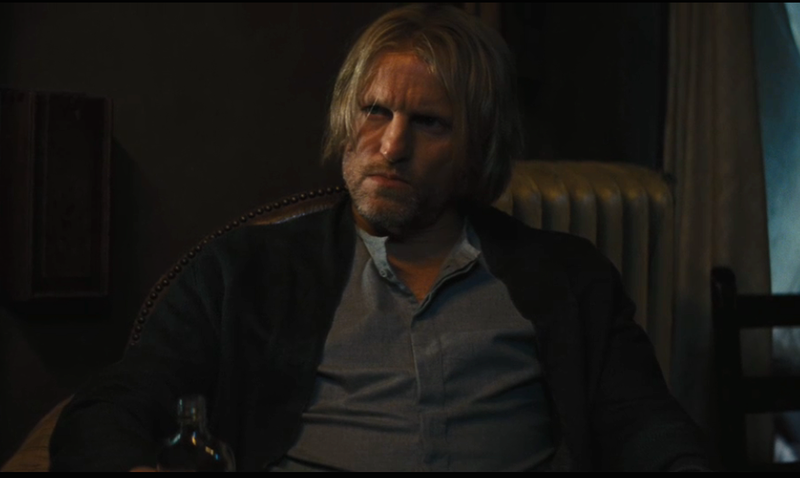 If you don’t have a pet and are over 21, you may go Haymitch and need liquor. Holo Capture 27B/6 Covert File Access Protocol: Init Code Blue upon Holo Indicator Illumination. So did you know what that clue meant? 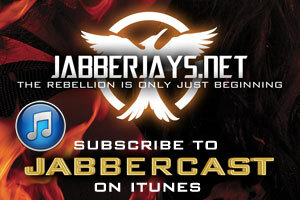 Do you have the thought process of Wiress or Beetee? If you did get that clue organically then three finger salute to you, tribute! 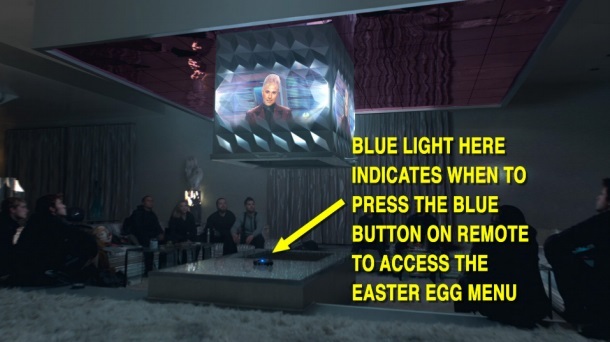 This means press the blue button on your Blu-ray remote when the Holo light is on. The next screen that appears after the Lionsgate logo is Squad 451 hidden out in the Capitol apartment watching Caesar Flickerman’s broadcast. On the hearth in front of them, below the screen, the holo is placed. When you see the blue light on the holo, press the blue button on your Blu-ray remote. 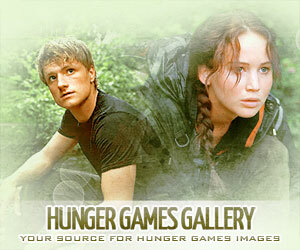 The Holo will show the map of the Capitol streets and Jackson asks Katniss to press the button that scans for pods. Eject The Hunger Games Mockingjay Part 2 from your player and go get The Hunger Games: Mockingjay Part 1 Blu-ray! Put it in the player and when you get to the menu you’ll notice the character pictures on the right. Underneath each picture is a code. 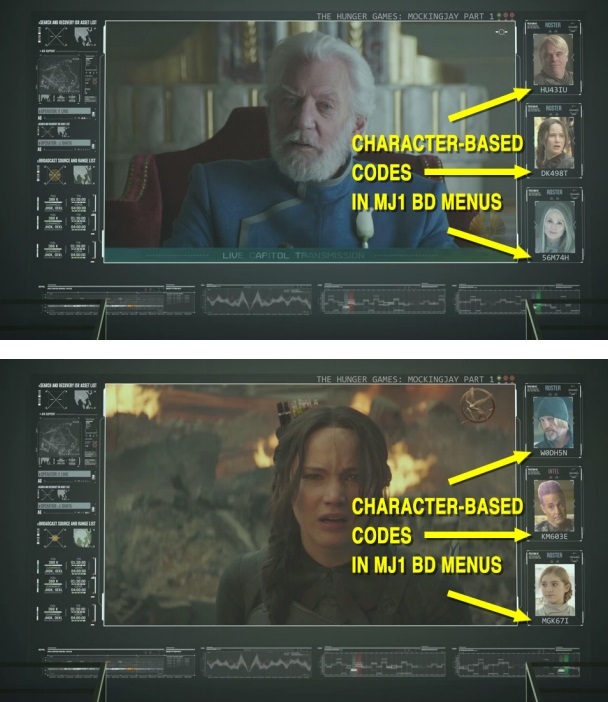 For example: Katniss’ code is ‘DK498T.’ Get your pen and paper and start noting down all of the characters and their unique code. Remember there are 24 in all and any of them could be the three pictures that appear on the Easter Egg screen so make sure you note down all of them. Don’t make the mistake I did which was to believe I had them all only to put Part 2 back in, see Mrs. Everdeen’s picture and realise I never got her code… meaning I had to eject it and put Part 1 back in and wait for her picture. Ugh! No doubt at this point it will soon register in your brain that all of these codes are alphanumeric (they contain letters and numbers). You will pick up your remote control and discover that all Blu-ray remotes only have numbers on them. This will be the lowest emotional point of your hero quest! If you are a patient person proceed to Step 6. So you’re not a patient person. At this point – with a sheet full of what appeared to be useless codes (but fear not you just have to decipher them still further) – I quit. I’d highly recommend, if you have a pet, to cuddle them for a little bit and that will automatically lower stress levels and will make you calm again like I did with my dog, Stanley Poochie. You can also take stress-relieving tips from the victors in Catching Fire: you can go all Katniss and head for a walk in the woods while cursing the person who decided to do this rather than just give you the deleted scenes. Perhaps Peeta is more you’re guy and you can disappear for a little while and bake or paint. Or if you are over the age of 21, you can go the Haymitch route and reach for the bourbon. Just one swift swig would do it, please drink responsibly! Now let’s take Katniss as an example here. 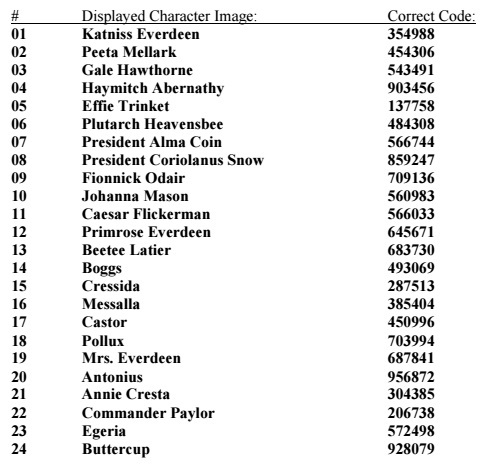 Her code from the Mockingjay Part 1 BD is ‘DK498T.’ If you look to the left of her picture, it includes the key to decipher her code into an appropriate numerical one. D=3, K=5 and T=8. So the final code that will grant you access to a deleted scene with Katniss’ picture is 354988. Type the code in to the picture using the number pad on your Blu-ray remote. 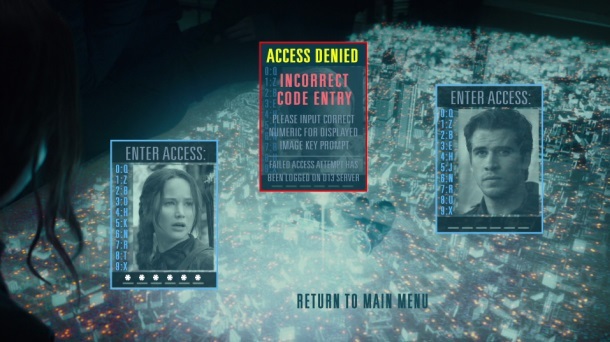 Hit the select button and the scene will finally start to play after a brief District 13-style hacking screen. After the scene finishes you will return to this screen. Use your arrow buttons to move to the right and repeat the process by typing in the appropriate code for the character to subsequently watch the second and third deleted scenes. Keep those codes handy because you’ll have to type them in every time and who knows which character picture will appear and what code you’ll need next time you put the disc in.